Do you have a parent, grandparent, or elderly loved one who appears sad or lacking interest in life? Depression among older adults and the elderly is very common, and it can often go undiagnosed and untreated. Untreated depression can result in increased alcohol or substance abuse, social difficulties, increased medical illnesses, or increased risk of suicide. Although many older adults do experience mental health conditions such as depression, it does not mean it’s normal! It’s a myth that depression is a natural part of aging. Depression can be treated successfully, and your loved one does not have to live their golden years suffering. There are a number of factors that can contribute to depression, including genetics, changes in the brain, or the effects of medications or medical illnesses. Other causes can be circumstances or events such as retirement, significant loss or death of a loved one, changes in living arrangements, lack of social support, isolation/loneliness, dealing with increased medical issues or chronic pain, stress, or caregiver stress. If you notice your loved one is frequently gloomy, seems unable to cope well with their medical issues or recent losses, or perhaps seems irritable and just doesn’t seem to be enjoying life, they will likely benefit from professional help. It’s important to have your loved one evaluated and treated for depression by a physician or mental health professional. Some antidepressant medications can be used in treating depression in the elderly, but the treating physician should always be consulted regarding the possible side effects or potential reactions with other medicines. Individual psychotherapy can be helpful for older adults who are struggling with the aging process, including coping with declining health issues, fears of death, coping with loss, or managing their emotions. Therapy can also help individuals gain a better understanding of the roots of their depression, learn healthier ways of coping, and rediscover enjoyment and meaning in their life. 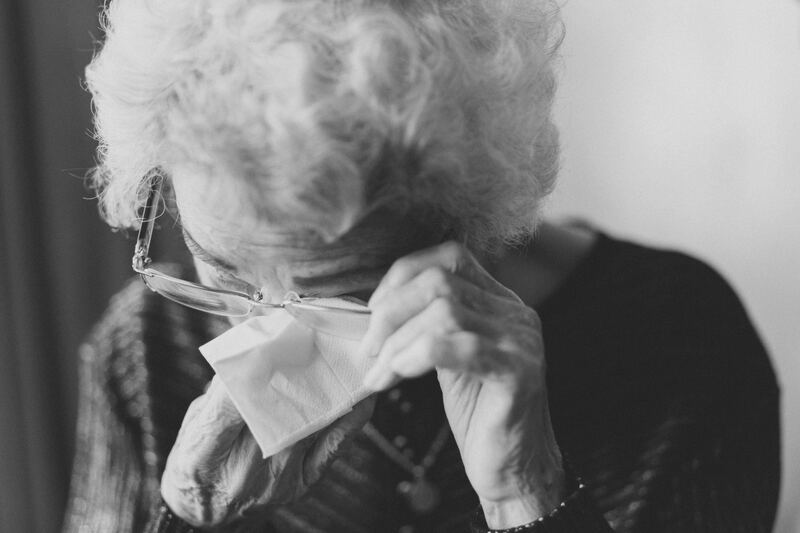 What are ways we can help our elderly loved ones who are struggling with depression? Attention/Affection: Visit with them, call them, listen to them, and let them know you care on a regular basis. Hug them! The elderly often spend days alone without much interaction. Receiving a phone call from a loved one can pick up their spirits. Activities: Encourage them to get outside for some fresh air, exercise/walk regularly, pick up a new hobby, or volunteer. Engaging in pleasant activities has been shown to improve mood and increase one’s sense of well-being. Health: Make sure they are eating healthy meals and getting enough sleep/rest. Medical Care: Encourage them to keep up with their medical care and adherence to medications and treatments. Do they need a calendar, daily reminders, or a pill box? Social: Help them increase their social support, perhaps through their church or community. Education: Provide educational resources or books on coping with depression, mindfulness, or self-compassion. Normalize: Help decrease the stigma felt towards mental health treatment. Recognize and validate their feelings. Depression is not a character flaw or a sign of weakness. Seek Help: Contact a psychologist or physician for an evaluation and treatment recommendations, even if you think the depression is mild. Untreated depression can worsen and lead to other negative outcomes. Never ignore comments about suicide, and report them to their doctor or psychologist. Dr. Garcia-Bravo is a licensed psychologist and the co-owner of Progressing Minds, PLLC in San Antonio, TX. She has extensive experience working with older adults going through difficult life transitions and mood disorders, both in individual therapy and group therapy. She provides a supportive and welcoming environment and helps men and women manage their stress, anxiety, and depression so they can live their lives with greater ease and purpose. If you would like to know more about how individual therapy can help, please use our contact form or call us at (210) 239-1399. Hello Dr Garcia-Bravo! Nice to see what you’re up to! Hi, so good to hear from you! Thank you!